In my family, we all have different tastes or dietary restrictions. So this Personalized Baked Oatmeal is a win win for everyone! This personalized baked oatmeal is not my idea though. It comes from Brenda Bennet’s new cookbook, Sugar-free Mom: Naturally Sweet and Sugar-free Recipes for the Whole Family. You may already know Brenda through her blog, Sugar Free Mom. I had the pleasure of reviewing the book. My whole family loved this baked oatmeal. It’s super easy to make too! If you are new to clean eating, then Brenda’s book may be perfect for you. Not only is it filled with lots of healthy recipes your family will love, she also explains the various types of sugars she uses as well as her kitchen essentials. Brenda is a mom so she is busy just like all of us are. These are recipes are easy and kid friendly. Many are diabetic and low carb as well. Not all the recipes are vegan, but many can be with a few tweaks. 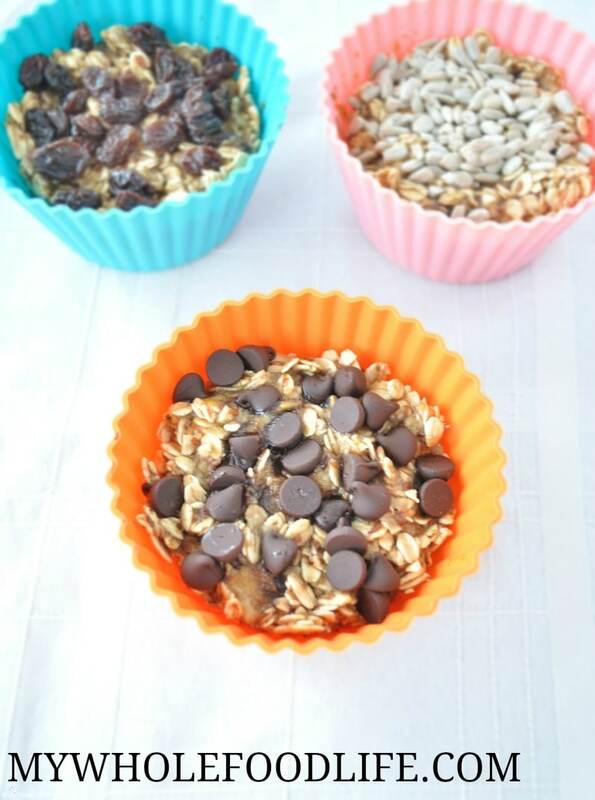 This personalized baked oatmeal is great if you have some picky eaters in your family. I used flax eggs and almond milk to keep mine vegan. Spoon batter into lined or greased muffin pans. I used both a 6 and a 12 standard sized muffin pan . Once all the mixture is in each muffin pan, sprinkle whatever toppings you like on each one and gently press them into the mixture. Serve immediately or refrigerate/freeze for later. Recipe used with permission from Sugar Free Mom: Naturally Sweetened Recipes for the Whole Family. You can also enter to win a copy. For US residents, you can win a hard copy. If you are not residing in the US, you can still enter to win a digital copy. Yay! Thank you for the lovely review and I'm so happy your family loved the recipe! You are so welcome!! The book is beautiful! Congrats! I think you probably could? I haven't tried to say for sure though. Just to keep doing what I'm doing! I make these all the time! They are delicious and you can totally personalize them! We like to add nuts and chocolate chips or orange rind, cocoa powder, peanut butter or almond butter, and the list goes on! Thanks for this great idea! I'm new to your blog and really enjoying it. This coming year I would like to try to find a way to incorporate simpler healthy meals that don't require so much cooking time and effort. I am aiming for daily exercise. Do you know the macros on the standard one without any additional toppings? Could I use coconut milk to make these nut free? Thanks!